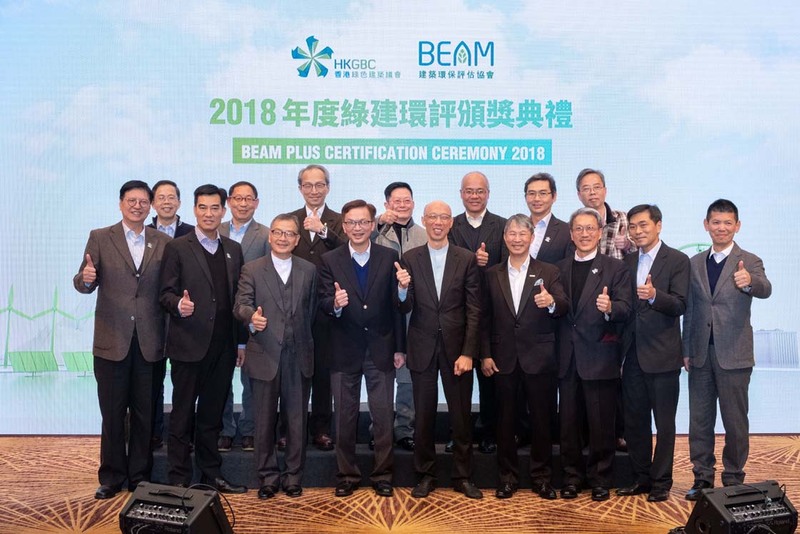 The Hong Kong Green Building Council (HKGBC) and BEAM Society Limited (BSL) honoured project teams whose BEAM Plus projects achieved Platinum and Gold ratings, as well as Excellent grade, at the BEAM Plus Certification Ceremony 2018 held on 13 December 2018. Officiating at the ceremony, Mr Wong Kam-sing, GBS, JP, Secretary for the Environment, and Mr Liu Chun-san, JP, Under Secretary for Development, presented nearly 50 certifications to BEAM Plus project teams. Other honourable guests included Mr Chan Ka-kui, SBS, JP, Chairman of Construction Industry Council and Mr So Kai-ming, Chairperson of BEAM Society Limited. Speaking at the ceremony, Mr Wong Kam-sing, GBS, JP, Secretary for the Environment, congratulated project teams. 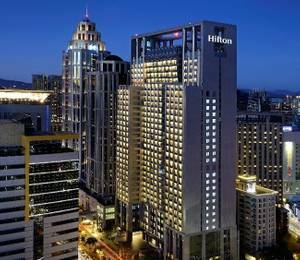 He stressed that buildings and their related activities contributed to 90 percent of electricity use and 60 percent of carbon emission in Hong Kong. Their performances in energy conservation and emission reduction are crucial to the environment. Mr Liu Chun-san, JP, Under Secretary for Development, admired the efforts made by BEAM Plus project teams to overcome various challenges. He also denoted that the government had set an example in striving for green elements in government buildings. Among the government projects that had registered BEAM Plus, most of them had achieved Platinum or Gold rating, to ensure the ideal sustainability performance. Mr So Kai-ming, Chairperson of BSL, mentioned that the BEAM Plus New Buildings assessment tool was under revision. 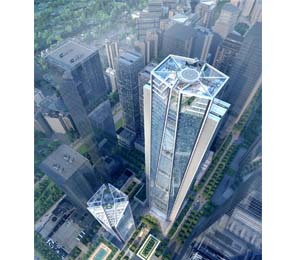 It was estimated that the upgraded Version 2.0 of BEAM Plus New Buildings would officially launch in 2019. Striving to improve the assessment tool, BSL had been continuously engaging industry stakeholders. Mr So believed that the revised credits and aspects in BEAM Plus met the demand of the green building market. “Shorten the administrative process provides more flexibility for developers,” he said. Ir Colin Chung, Chairman of Green Labelling Committee of the HKGBC was delighted that owners and developers demonstrated their commitment in turning their premises green, by achieving Platinum rating and Excellent grade in BEAM Plus Existing Buildings V2.0. He also congratulated the first BEAM Plus Neighbourhood V1.0 certified project. Ir Chung expected the industry would utilise the BEAM Plus Neighbourhood assessment tool to design and plan better quality public space. Nearly 50 certifications were presented to project teams whose projects achieved outstanding ratings - Platinum, Excellent and Gold. 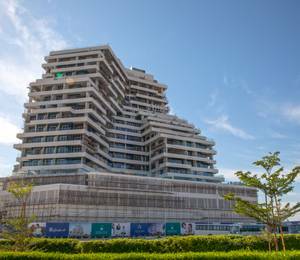 There was the first project certified as Platinum rating under BEAM Plus Neighbourhood V1.0. The sustainability performance at the masterplanning stage of the development were being assessed. The project success will bring more green spaces and build a healthier living environment to the community. 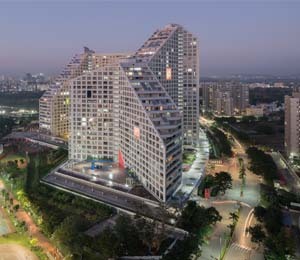 Assessed by BSL and certified by the HKGBC, BEAM Plus assessment is the Hong Kong’ leading initiative to offer independent assessments of building sustainability performance relating to the planning, design, construction, operation and management. BEAM Plus consists of four assessment tools, namely New Buildings, Existing Buildings, Interiors and Neighbourhood. 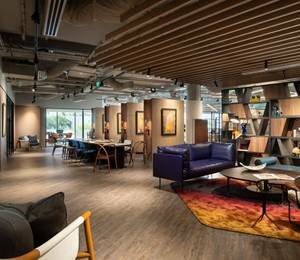 Currently there are over 1,000 registered BEAM Plus projects with diverse types, for example, residential, commercial, government buildings, infrastructure, institutional projects, etc., marking a milestone for green building movement in Hong Kong.